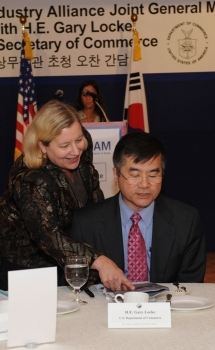 Guest blog post by Amy Jackson, President of the American Chamber of Commerce in Korea. 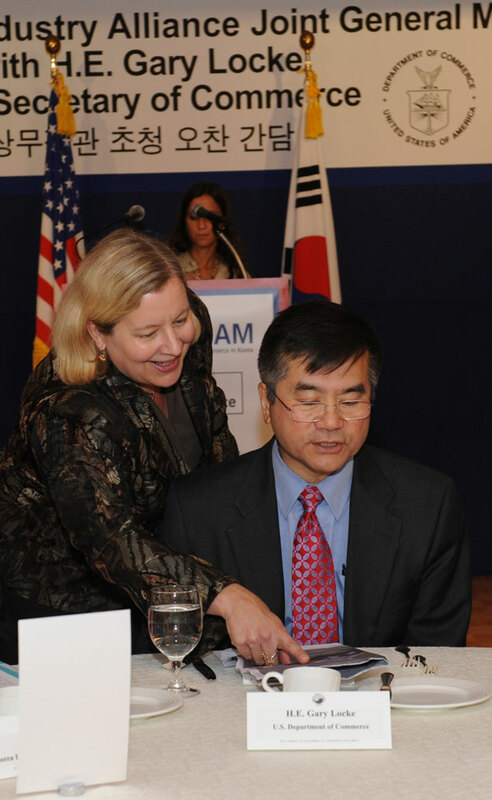 The American Chamber of Commerce in Korea (AMCHAM Korea) was very pleased to welcome Secretary of Commerce Gary Locke and his delegation of four distinguished Members of Congress to Korea this week. Their visit symbolizes the strong ties that underline the U.S.-Korea bilateral relationship – and also the expectation that the U.S.-Korea Free Trade Agreement (KORUS FTA) will soon be taken up by the legislatures in both countries for a vote. AMCHAM Korea is the oldest and largest foreign business association in Korea. We are a fully private organization, and we have around 2,000 individual members coming from about 1,000 companies that span all sectors of the economy – aerospace, automotive, agriculture, consumer products, financial services, healthcare, education, professional services, and many more. Our member companies are big and small and employee hundreds of thousands of U.S. workers throughout the United States. Our key message to Secretary Locke and his delegation was that early ratification of the KORUS FTA is essential for the continued success of U.S. companies in the $1 trillion dollar Korean economy. Our members emphasized that they compete head-to-head with European companies here, and once the Korea-EU FTA goes into effect on July 1, European companies will have a significant cost advantage over their U.S. competitors. In addition, companies in the Congressional districts of the Members who accompanied the Secretary noted that they are already looking at changes in their supply chains as a result of the Korea-EU and KORUS FTAs. If KORUS goes into effect soon, this could mean significant increase in sourcing from U.S. suppliers. At a large, luncheon meeting co-hosted by AMCHAM Korea and the Korea FTA Alliance today in Seoul, the 300 members of the audience were delighted to hear Secretary Locke state that the KORUS FTA is a top priority for the Obama Administration. The Secretary noted that this agreement is critical to the economies of both the U.S. and Korea, and that under the FTA, nearly 95 percent of bilateral trade in consumer and industrial products will become duty free within three years of the date the FTA enters into force. The U.S. International Trade Commission (ITC) estimates that the KORUS FTA will increase U.S. GDP by at least $10 billion and increase U.S. goods exports to Korea by $10-11 billion annually. In addition to the significant tariff benefits this agreement will bring about immediately, the FTA will also help level the playing field for American businesses, farmers, and workers by bringing new predictability, transparency, and fairness into all aspects of the Korean economy. Passage of the KORUS FTA will not only demonstrate U.S. leadership in the Asia Pacific region, but it is also a key means for the United States to reinforce its bilateral relationship with one of its most important allies. The U.S.-Korea alliance is a multi-faceted bond that goes back more than half a century. This agreement will add an important third pillar of economic integration to our already strong bilateral political and military alliance. We anticipate that the KORUS FTA will be a win-win for the national interests of both countries by creating unprecedented opportunities and economic benefits. That is why it is so critical that Congress does not wait, and is why the Secretary has made this very important trip to Korea.